This Instagram post alone had 1.8 million likes. While VisitFlorida took a beating from state officials last year for paying singer Pitbull $1 million for his work as a tourism ambassador, Tourism Australia is counting the returns from its brilliant choice of superstar actor Chris Hemsworth – aka Thor -- as its ambassador. According to Brisbane’s Courier Mail, Hemsworth has returned Tourism Australia’s investment almost 150 times over. When Tourism Australia signed Hemsworth in 2016 he was paid $1.25 million, the publication said. Since then he has generated an ‘Estimated Advertising Value’ of $171 million – and he’s still going strong promoting Australia. 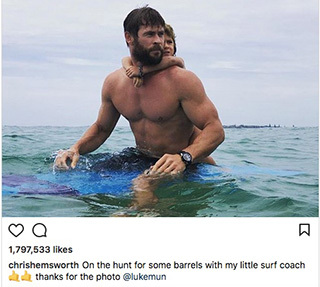 Hemsworth, one of the world’s most famous actors and celebrities, lives in Byron Bay with his wife Elsa Pataky and their three children. Some 14.5 million Instagram followers read his posts on Australia and revel in the gloriously photogenic places he visits and the Aussie characters he meets. It’s the sort of publicity most only dream of. Not to mention that famous Crocodile Dundee Superbowl ad, featuring Chris and Liam Hemsworth, Hugh Jackman, Paul Hogan, Margot Robbie, Ruby Rose and Russell Crowe, as well as Danny McBride.